Ask the Experts: Do You Recommend Giving the Band/DJ a List of Songs You Like and Don’t Like? Yes. We provide a setlist to all couples and they can decide what songs they like and dislike. They can see what genres we have and we can mix and match according to taste. The set is fully tailorable or we can use our common setlist which goes down well for all weddings we do. We think that it’s a great idea in the main; as it gives the band a flavour of what will be enjoyed and what to stay clear of. On the other hand, couples should bear in mind that weddings include the full spectrum of age demographics from young kids to Octogenarians so sometimes the band has to cater to everyone’s needs so they feel included. We as The Hitmen Trio have a unique modern take on weddings but usually play some of the older stuff at the start and get progressively more modern with mash ups and medleys as the night progresses ensuring there is momentum to a smashing climax! Providing your wedding DJ with a list of music that you like in advance is a great idea. With as little as 3 songs or bands you can paint a picture very quickly of what a couple would like to hear on the night. One bride and groom might suggest something along the lines of Beyonce, Justin Bieber and Rihanna and another might suggest The Killers, Oasis and Kings Of Leon. These tiny pieces of information are likely to guide the DJ set in different directions. Naming songs that you don’t want to hear can also be very helpful. For some people Abba means a great time but for others, it’s their idea of hell! By providing your DJ with your thoughts on the music in advance you are taking the guess work out of the job which is a great thing for both you and your DJ. It’s your big day so if you know what you want on the music front, don’t hesitate to tell the DJ exactly what you are after. Brian from Panic Animal | View ProfileWe have been doing wedding for many years now and its always important to listen to your bride and groom with regards to ideas they have. 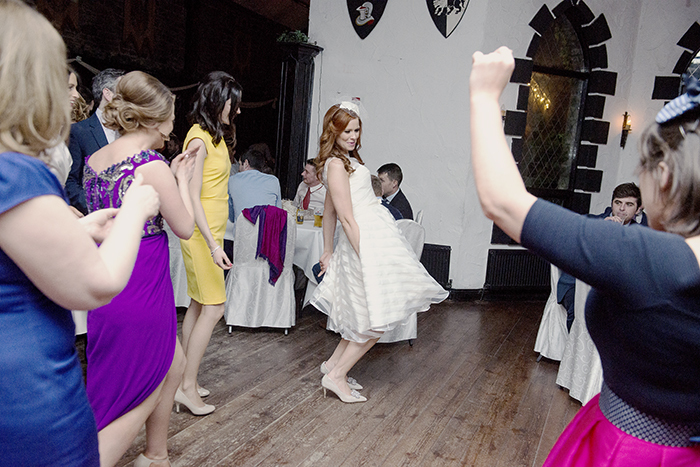 The bottom line is they get what they want but after i explain the working process and ingredients of a wedding dance floor, they pretty much leave it to us…….We the Band know what fills a dance floor and more importantly know what doesn’t. Its best leave it to us on the night, call it as we see it and not be held to a set-list provided by someone else. We have been doing wedding for many years now and it’s always important to listen to your bride and groom with regards to ideas they have. The bottom line is they get what they want but after I explain the working process and ingredients of a wedding dance floor, they pretty much leave it to us… We, the band, know what fills a dance floor and more importantly know what doesn’t. It’s best to leave it to us on the night, call it as we see it. When planning a personalised wedding party set-list, Harlequin Wedding Band’s favoured approach is to get to know the couple really well. We try our best to get insight from the hosts into the guests and their backgrounds. Nobody goes to a party to sit down – the trick is to play to the audience in front of you and unless you are psychic you can’t hone in on the specific tastes unless you prepare in advance. Music preferences at weddings are always different and considering that in most cases bands are booked 2 years in advance – we have plenty of time to become acquainted with your interests and music favourites. We always encourage couples to send Harlequin Wedding Band a list of their favourite songs – tracks of course that are great for dancing. Added to this, it’s a great idea to ask people to make requests from the band all night. Any band worth their salt will have a crack at a good request. Most top bands will know all the classics and will have no problem delivering. Challenge your band – interested musicians love learning new and interesting music and most of all love to deliver all your heart’s desire on the biggest night of your lives. I always ask every couple to email me a playlist of songs they would like played and the songs they don’t want played. As it is their special day, it is very important for me to find out what genres of music they like. Every wedding is different and people like different genres of music and with the playlist of songs supplied by the couple, it is a great indication of what music to play for their wedding.​​ For the Disco part of the night I use two 120″ video screens to show music videos from the playlist provided by the couple. I find that this adds a bit of fun to the night. I wouldn’t suggest providing a playlist per se, but certainly some song suggestions that you might like or don’t want and then your DJ can advise you on those. Even the most experienced DJs or music programmers couldn’t plan a full playlist in advance without “reading” the crowd and the floor on the night “as live”. What a client might like could be completely different to the people attending and the same song might work well at one wedding and not at the next. If you limit yourself to a playlist you are literally putting handcuffs on the potential for the event to be a success. I always take on board ‘the no play’ songs, but again I will always ask for and then advise as to these in advance. Sometimes you get asked not to play song A or song B, but that could be the most popular song that works for the guests, so myself and my client will talk this through when we do our consultation. We absolutely recommend giving the band/DJ a list of songs you really do or don’t want to hear. We love seeing the reactions of a couple and their friends when we drop a tune that’s special to them – it can help make the night all the more unforgettable! Having said that, sometimes it’s best not to be too specific, you’ll want to give the DJ the flexibility to keep the crowd happy. Similarly, giving guests a song request option in advance can be a good guideline for the DJ, but it can also result in a disjointed set that only caters to one or two people per song – this can sometimes result in the majority of the crowd losing interest and wandering off. There’s also no problem letting a band know if there’s anything in their set you love or hate, BUT – we cannot overstate enough the importance of picking your band based on what they DO play, rather than what you WANT them to play – that way you have them playing to their strengths and not trying to do something they’re just not suited for. Find a band that already plays what you want and you’ve found your wedding band! Yes, definitely. Most couples request this and it is a great help, and most importantly, the band/DJ, doesn’t play music that the bride and groom hate or dislike!